Be your own Superhero! Now recruiting! Always wanted to try roller derby? Now here’s your chance. Training starts in October. No tryouts!!! All skaters of all skill levels welcome. Never skated before, who cares! We will train you!! We are accepting Junior skaters ages 7-17 and Adult skaters 18+. 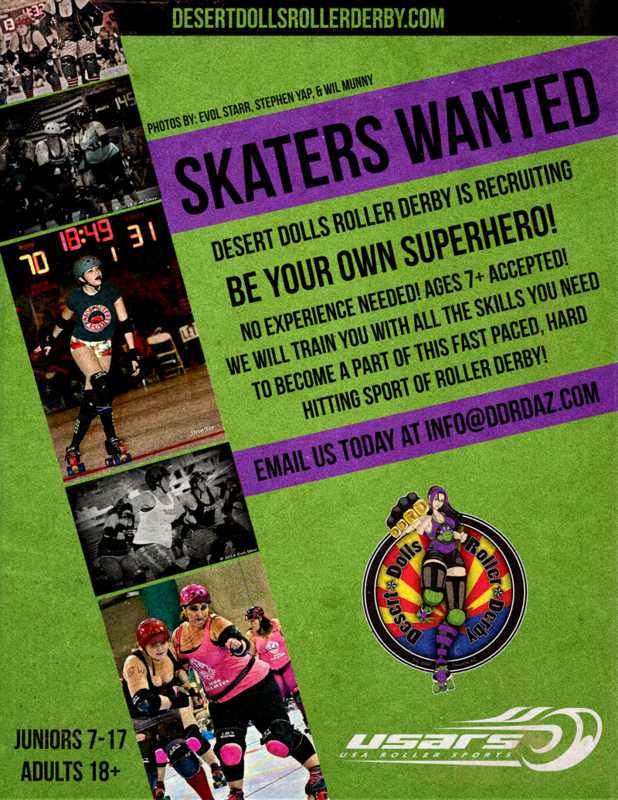 Send us an email at info@ddrdaz.com to get more information on how you can become a part of Desert Dolls Roller Derby!! Hello! I am trying to find my way into derby, but haven’t found (made) the time until now! Training starts in October, so would that be the next opportunity to join? Thanks! I sent you an email with follow up information. We actually have a new group starting this month! Feel free to reply to my email or email us at info@ddraz.com for more information!! Hey DDRD your guy’s email on here seems to now work.. Well at least for me and I do t know how to get a hold of u guys about the Jr league. Hey there! You can email us at info@ddrdaz.com or hit us up on facebook! Bringing the fun back to flat track!